Gold prices head higher after taking a beating over the past week or so. The gold bugs have come out to play. Gold bounced back Monday after taking a massive beating over the past week or so. Early Monday, gold prices popped back above $1,400 for the first time in a week. Prices are still a far cry from their record $1,900 level but the modest bounce is encouraging for gold bugs. It was exactly one week ago that gold prices plunged more than 9% in their biggest one-day sell-off in decades. That appeared to be enough of a rout for big money to come rolling back in. Hedge funds and commodity trading advisers added to their gold holdings, while cutting back on their short bets that gold would fall further. According to the latest commitment of traders report from the Commodity Futures Trading Commission, hedge funds and advisers increased their net long positions to 68,662 contracts, while trimming their short bets to 54,025. And while hedge fund titan John Paulson, who runs the Paulson Advantage Fund, has seen his gold holdings lose value (he has a 21.75% stake in the SPDR Gold Trust ETF), on balance, he's still up on his investment. Gold was around $905 when he started buying four years ago. 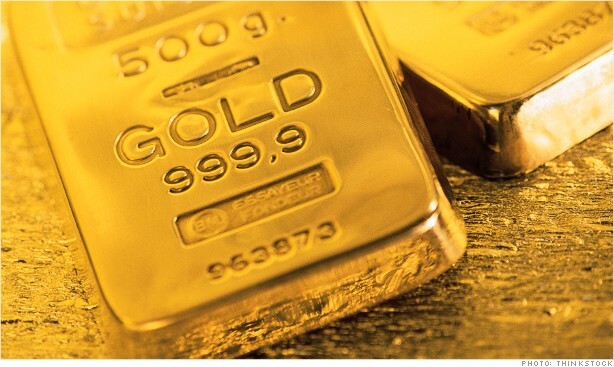 Gold prices gained more than 2% Monday, giving the gold ETF (GLD) a nice bounce, and boosting shares of gold miners Randgold (GOLD), Eldorado Gold (EGC) and Goldcorp (GG). It will probably take more than one day of gains to send the bears packing but for now, investors and StockTwits traders are cautiously optimistic. Doesn't look like the shorts are ready to jump back into the fray just yet. Gold is holding pretty firmly above $1,400 for the moment. But that doesn't mean the precious metal is completely out of the woods. Remember, prices hit a record high just above $1,900 back in September 2011. After dropping down to the $1,500-$1,600 level, they'd been pretty steady...until now. It's tough to read the tea leaves here. Signs of slowing growth in China, Goldman slashing its price forecast and worries about central bank selling continues to underpin sentiment. For every optimist, there's a pessimist. I wouldn't count gold out just yet. There's a lot out there to keep investors on edge. And in times of uncertainty, gold almost always looks like a viable alternative.